Shower Commode Chair - SHIPS FREE! 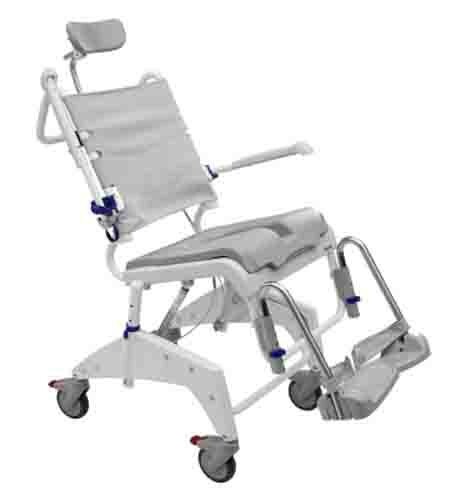 OceanVIP Shower Commode Chair, manufactured by Clarke Health Care, is a bathroom safety device that "tilts-in-space" for unique medical needs. Featuring a stainless steel design, this Aquatec shower is incredible durable and trustworthy. In addition to the stainless steel, it also offers 3 locking casters and one directional caster lock. 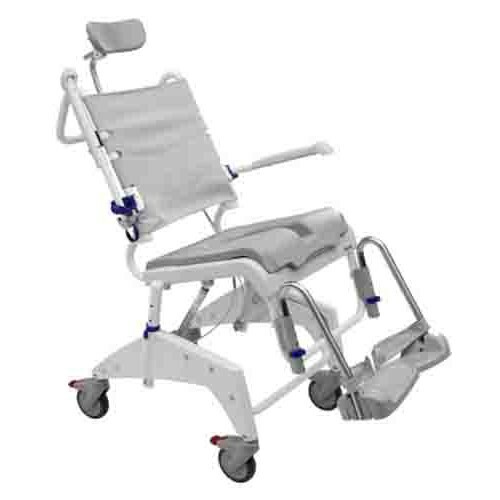 Offering an adjustable height, transferring patients becomes easier for the caregiver. However, to offer patient comfort, this seat features a soft seat overlay and an adjustable headrest. The OceanVIP Shower Commode Chair integrates a completely lidded collection pan, head support, and foot rests, too. To ensure patient safety, the OceanVIP offers an adjustable sling back upholstery and heel loops. You are able to accomplish the "tile" motion by use of the level on the push bar. If this commode shower chair does not meet your specific needs, check out this commode shower chair here. Safety integration through loops and sling. Width Between Arms/Handles: 17.5 inches. Seat to Footrest: 22 inches. Height Seat to Floor: 16.4 to 20.3 inches. Seat Angle: 0 to 35 Degrees. Application: To assist with the safety and security while using the shower and commode. Warranty: 2 years on chair; 1 year on cylinders.